With access to insights at their fingertips, more people will be empowered to create economic value on their own without traditional employment. In 2010, I was part of a ‘ThinkFuture’ team sponsored by IBM to study the future workforce and its implications for HR. I ‘interviewed’ my son, who was then seven years old, and asked him what he thought ‘work’ will look like for him in the future. I was expecting some typical school-kid answers like ‘policeman’, ‘bus driver’ or ‘doctor’ but he replied: “I will create something new every day!” Naïve though it may seem, and many parents would have taken it at face value, but to me, it was thought-provoking at that time in light of the increasing global interest on the topic of the future of work. After all, many of today’s workplaces in the real world are designed as places for work, literally. And ‘work’, as defined in the dictionary, is to carry out tasks or fulfill duties regularly for a salary. Assuming most kids have similar aspirations about their future, the question, therefore, is whether conventional workplaces are adequately equipped to satisfy the creative desires of future generations over the next ten to twenty years, and beyond. So, to define how the future workplace looks like, we first need to understand the characteristics of the future workforce and what ‘work’ means to them, how individuals generate economic value for themselves, and how organizations engage them to create business and societal value. Over the last fifty years, we have seen new generations of workforce emerged at a quicker pace as compared to the preceding hundred. We had the ‘Typewriter’ generation in the 70’s where words-per-minute was a key competency for many jobs. The ‘PC’ generation in the 80’s made typing skills a thing of the past, just copy and paste! Then came the ‘Pager’, ‘Handphone’ and ‘Laptop’ generation in the 90’s, where such gadgets were symbols of mobility and connectedness. The ‘Swipe’ generation emerged in the new millennium. My son lost interest in a LeapFrog tablet which I bought for him when he was two because it did not respond to his swipe gesture! Then enters the ‘Social’ and ‘Crowd’ generation of today, where ‘Friends’, ‘Likes’ and ‘Followers’ are not just icons but bragging rights for personal pride and self-worth. In this age, reputation has become digital and people spend an inordinate amount of time building and maintaining it online. The more entrepreneurial ones monetize it for economic gains with an entirely new industry of social influencers, marketers, and retailers created out of virtually nothing. The emergence of ‘Cognitive’ and ‘Machine Learning’ will be the defining lexicon of the 2020 generation and beyond. We see such languages appearing everywhere today. Google “Machine Learning” and it returns 652 million hits at the time of this writing! It will not take very long to turn this from hype to norm. Gone will be the days where one has to do their own analyses to draw insights. Instead, insights and intelligent predictions are expected without even a mouse-click, if we still use mouse at all by then. If you wonder why you are getting medical adverts on your social page and others don’t, you have probably been sharing photos of unhealthy food choices for years! Unbeknownst to you, the technologies you use to learn about your lifestyle choices and predicts what attention you need and when. To the generations prior, this is a rather scary thought. But to future generations, this is going to be a basic expectation. In other words, the workforce of the future demands for, and acts on, insights and not just loosely coupled information because none of them have the time nor capacity to make sense of the universe of information which is exploding at an incomprehensible rate that requires beyond-human ability to synthesize. This will be the fuel that propels the fourth industrial revolution from mere conjecture to reality. More and more brick-and-mortar businesses will be disrupted by players without ‘bricks’ and ‘mortars’. With access to insights at their fingertips, more people will be empowered to create economic value on their own without traditional employment. Just a few years ago, the likes of Uber and Airbnb were unimaginable. But today, they are serious billion dollar enterprises who created Blue Oceans out of the already crowded market dominated by traditional businesses. Want to buy a car with a specific make and model? An app will point you to the nearest owner for a test drive, who will then receive a fee for helping you load an order. Anyone who owns a car can be a car salesman! Going forward, more and more products and services will be ‘Uberized’, so will education, talent, and skills. Without a doubt, the common theme across these generational shifts is technology. It is no longer just means for automation, efficiency, and productivity. The evolution of technology has become the biggest influencer of human mindset, preference, and behavior, more so than fellow humans like educators, friends, and parents. With the equivalence of yesterday’s supercomputing power in every hand today and tomorrow, information, insights, and intelligence will be as ubiquitous as the air we breathe, it’s a natural resource and it’s free. Call it Vitamin I3 (information, insights, intelligence), more nutritious than ever and future generations will feed on it. What this means is that every person, with or without formal education or qualification, can create higher forms of economic value completely on their own. With virtually zero start-up cost, one can simply make money as a value creator. Imagine that you need no architect to design buildings, no programmer to write codes, no doctor to prescribe medicines, no lawyer to file court papers, no driver to drive buses, the list goes on. 3D printer technology will mature to an extent that it costs no more than today’s personal printers. Not only can anyone create knowledge capital, anyone can produce real physical products without a factory! This may seem exaggerated now, but I believe I will see this in my lifetime. The gig economy will expand to a scale that makes employees wonder why they even bother to sit by an office desk doing mundane work and makes product engineers wonder why they are paid the same salary whether their products sell a million copies or just a few. You get the drift. None of these arrangements require an individual, or a team, to be an employee of any organization – no employment contract, no performance appraisal, no employee benefit to worry about, etc. Real-time evaluation, feedback, and endorsement on their quality, service, and capability will contribute to their digital reputation in the public domain regulated by the crowd. This digital reputation becomes their “bread and butter”, which they build and maintain over time, and which defines their value and worth to any future prospect. 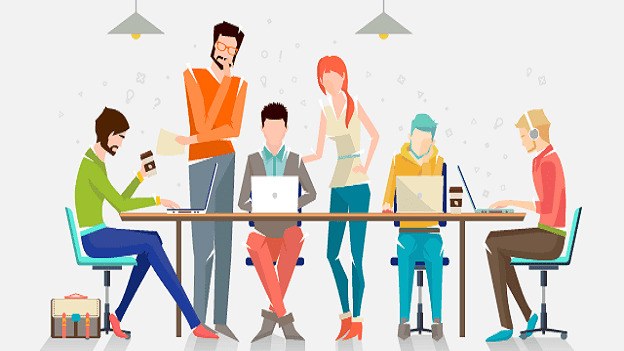 To adapt and enable such new forms of participative work arrangements, corporate functions like HR, Finance, Procurement and IT operating as separate functions in most organizations today will need a new paradigm shift. Perhaps they will converge into a new form of an integrated corporate entity whose mission is to engage global Gig-ers out there to be part of the organization’s value creation ecosystem. Such an entity will put in place the right technologies, armed with cognitive and machine learning capabilities, to manage these new work arrangements, engage the limitless cloud of talents out there on a global scale, sus out the truly valued ones, and manage and maintain the relationship ecosystem thereafter. On the other hand, while we tend to define ‘workplace’ in physical and environmental terms today, the virtual or digital dimension will likely matter more to the workforce of the future where individuals value their digital real-estate more so than physical ones. With digital workbench and dashboard complete with cognitively enabled tools for communication, collaboration, production, and distribution, anyone can virtually own an ‘office’ and run their business off it. Consistent with a recently published study by Mercer where “adaptive work”, “digital living”, “talent ecosystem”, “rethinking HR paradigm”, and “distributed teaming” are some of the top talent trends outlined, we will likely see significant and disruptive changes over the next decade from the status quo. Although the transition will not happen overnight, it has become increasingly pressing that organizations need to figure out ways to imbue agility into how they operate or risk being left behind. Beyond just mindsets, behaviors and skills, agility requires an all-of-organization approach as well from business models, operating structures, management systems to technology infrastructures. Especially for traditional brick-and-mortar businesses, the journey must begin by anticipating how the future will disrupt their core businesses and take the necessary steps to stay on or ahead of the curve.